Create, price and order your own unique custom blend online! Simply select your tile size and tile palette, and decide the percentage of each color to be blended. Then determine the square footage or sheets of tile required for your project. Each sheet measures 1.15 sq. ft. and is face-mounted with clear film. No minimum quantity order. 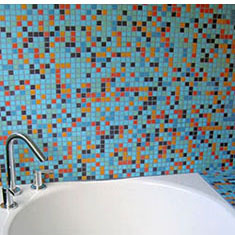 Custom blends of ¾” tile are available in an offset pattern for an additional $0.50/sheet. If you would like your blend to be offset, please specify in the comments area of the order form and someone from customer service will contact you. If you have any questions, please contact customer service at info@hakatai.com or 888-667-2429. Lead Time Note: Custom blend production can be accomplished within 2 weeks from the point of us receiving your 50% deposit (this does not include shipping time), depending on order size. The remaining balance including shipping will be due prior to shipment. Thank you.